Tool, Korn, Rob Zombie, and Incubus are some of the bands slated to make their way to north Florida in the spring for the ninth annual Welcome to Rockville. On Monday (Dec. 3), Danny Wimmer Presents unleashed the full lineup for next year’s edition of the annual rock and metal-centric music festival. Joining the aforementioned acts on the event’s roster will be the Prodigy, Bring Me the Horizon, Evanescence, Chevelle, Flogging Molly, Killswitch Engage, Circa Survive, Tom Morello, Shinedown, and Judas Priest, who will make their Welcome to Rockville debut. “Judas Priest are primed and ready to unleash new Firepower with full metal fury on the USA again as we are one of the headliners at Welcome To Rockville in Jacksonville, Florida! The Priest is back!” lead vocalist Rob Halford said in a press statement. As if the lineup for next year’s event wasn’t enough, festival organizers also revealed that the yearly event has expanded from two days to three. Dubbed “Florida’s Biggest Rock Experience,” the music festival will return to its longtime home of Metropolitan Park in Jacksonville, Florida during the weekend of May 3-5. Last year’s event was certificated sold out with a whopping 90,000 attendees showing up for the two-day event. Tickets for Welcome to Rockville go on sale this Friday, Dec. 7, at noon EST. Tickets available include weekend general admission, weekend VIP, single-day general admission, and single-day VIP. For more information about the lineup, tickets, or general questions, head on over to Welcome to Rockville’s website. For now, the complete daily music lineup can be seen below. This entry was posted in Uncategorized and tagged Bring Me The Horizon, Chevelle, Circa Survive, Evanescence, festival, Flogging Molly, Incubus, Killswitch Engage, Korn, music festival, Rob Zombie, Tool, Welcome to Rockville. Bookmark the permalink. Thrice and Circa Survive are about to prove why they are two of the hardest working bands in the rock music world. On Tuesday (July 25), the California-based band and the Pennsylvania-founded act announced plans to hit the North American roads for a massive co-headlining tour. The over-a-month-long tour will kick off on Nov. 2 at the City National Civic in San Jose, California and wrap up on Dec. 8 at Myth Live in Saint Paul, Minnesota. The tour itinerary also finds the bands performing two consecutive nights at certain stops. Those location include: the Shrine Expo Hall in Los Angeles; the House of Blues in Lake Buena Vista, Florida; the Starland Ballroom in Sayreville, New Jersey; the Electric Factory in Philadelphia; and the House of Blues in Boston. 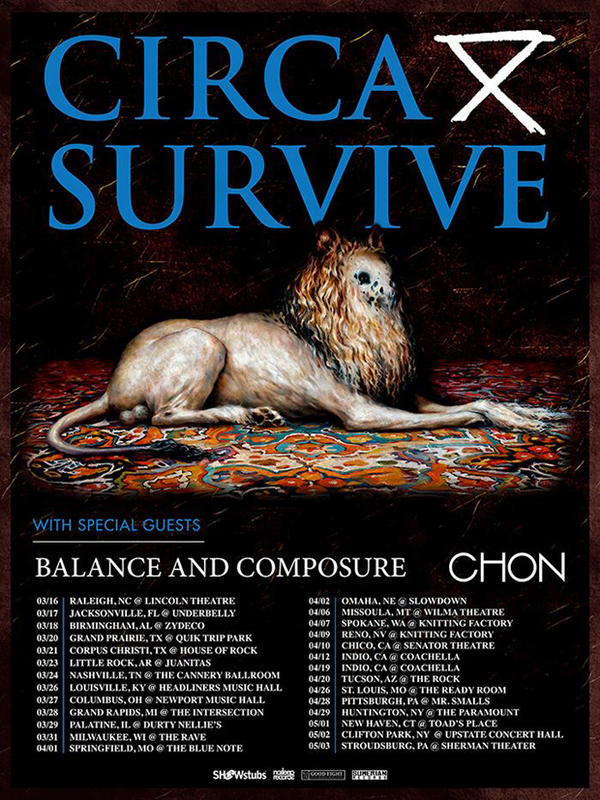 Accompanying the two acts on tour will be CHON and Balance and Composure. A special fan club pre-sale is currently underway while general tickets will go on sale beginning this Friday, July 28, at noon local time. For more information about the tour, tickets, or VIP packages, head on over here. Earlier this month, Circa Survive announced the release of their sixth studio album, The Amulet. The Amulet is set to be released on Sept. 22 via Hopeless Records with pre-orders for the album are available here. Currently, Circa Survive is on tour with AFI and Citizen. As for Thrice, the group recently wrapped up their summer tour with the Deftones and Rise Against. Thrice’s last studio album was 2016’s To Be Everywhere Is to Be Nowhere, but rumor has it that the group is currently working on a new album. That new material, which has yet to be formally confirmed, will reportedly see a release of 2018. For now, the complete list of fall tour dates can be seen below. This entry was posted in Music News and tagged Balance and Composure, CHON, Circa Survive, Fall tour, music, music news, Thrice, tour, tour dates. Bookmark the permalink. If you’re a Circa Survive fan, then there is a slew of good news heading your way. On Monday (July 10), the Pennsylvania-founded band announced plans to release a brand new album in the fall. The record, the band’s sixth, will be titled The Amulet and is set to be released on Sept. 22. Taking to Twitter, the group announced the new album news. “Excited to announce our new album ‘The Amulet’ will be release on September 22,” the band posted on the social media platform. In conjunction with the new album’s announcement, the band released the lead single from the impending release; a track titled “Lustration.” Watch the group’s six-minute music video for the new song above. Pre-orders for The Amulet are currently available on Circa’s website here. The Amulet is the follow-up to Circa’s 2014 release Descensus. In addition to announcing the new album and unveiling the music video for its lead single, Circa has also announced that they have joined the Hopeless Records family. “Welcome Circa Survive to the Hopeless fam!,” Hopeless Records posted on their official Twitter page. 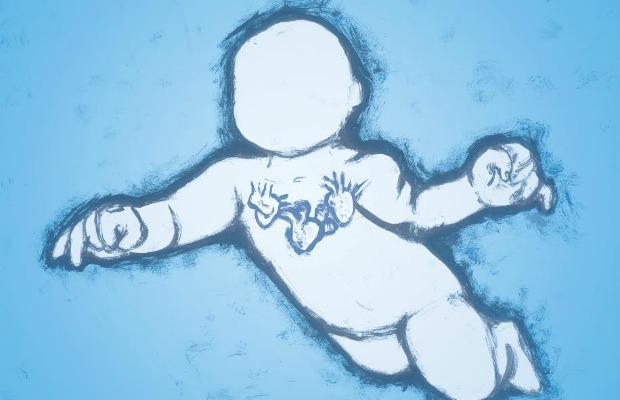 Circa Survive will now join Bayside, New Found Glory, Taking Back Sunday, and Sum 41 on Hopeless’ roster. The Amulet‘s confirmation comes almost a year after frontman Anthony Green held an AMA (Ask Me Anything) on Reddit. During the Q & A session, Green told readers that a new Circa album was on the way, but that they had yet to finalize when it would be released. 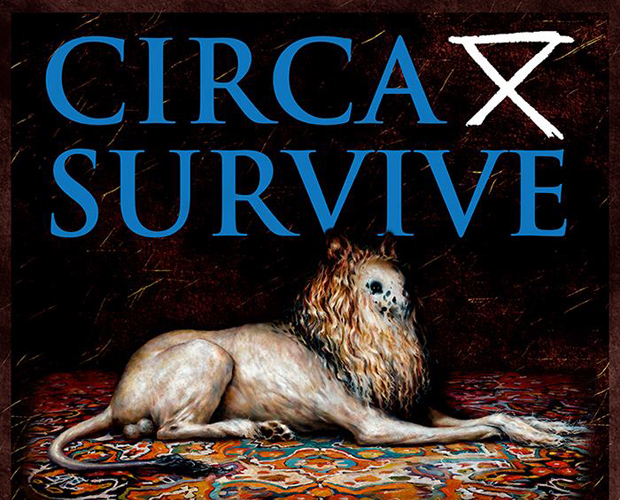 A few months back, Circa Survive announced plans to hit the road alongside AFI. The tour will kick off this Friday, July 14, at the Express Live Indoor Pavilion in Columbus, Ohio and wrap up three weeks later on Aug. 5 at the Paramount Theatre in Seattle. The complete list of upcoming tour dates can be seen below. This entry was posted in Music News, Music Videos and tagged Circa Survive, Lustration, music, music news, new music, The Amulet. Bookmark the permalink. After cryptically teasing that something big was coming in honor of the tenth anniversary of Juturna, Circa Survive have now confirmed what all fans have been hoping for. As anticipated, the band or more specifically frontman Anthony Green, has revealed that they will be heading out on tour this Fall in honor of the tenth anniversary of their much-loved, debut record. In addition to the tour celebrating the tenth anniversary of the album that gave us “Act Appalled,” Circa has also revealed that they will be releasing a special limited edition 3xLP deluxe vinyl reissue of Juturna. The catch is the number of vinyls that will be pressed for the occasion; 2,500. At the moment, the band have pre-orders going on, so if you want one, it might be time to be heading over there to purchase one. The deluxe vinyl reissue will contain 34 tracks, three different looking records, and will be housed in a triple gate fold jacket with expanded art. For more information, check out the band’s website. Also, don’t forget to also check out the tour dates for the “Juturna Tenth Anniversary Tour.” VIP tickets for the show are now on sale while general admission tickets will go on sale beginning this Friday, July 31 at 10 a.m., local time. Oct 24 – Baltimore, MD @ Rams Head Live! 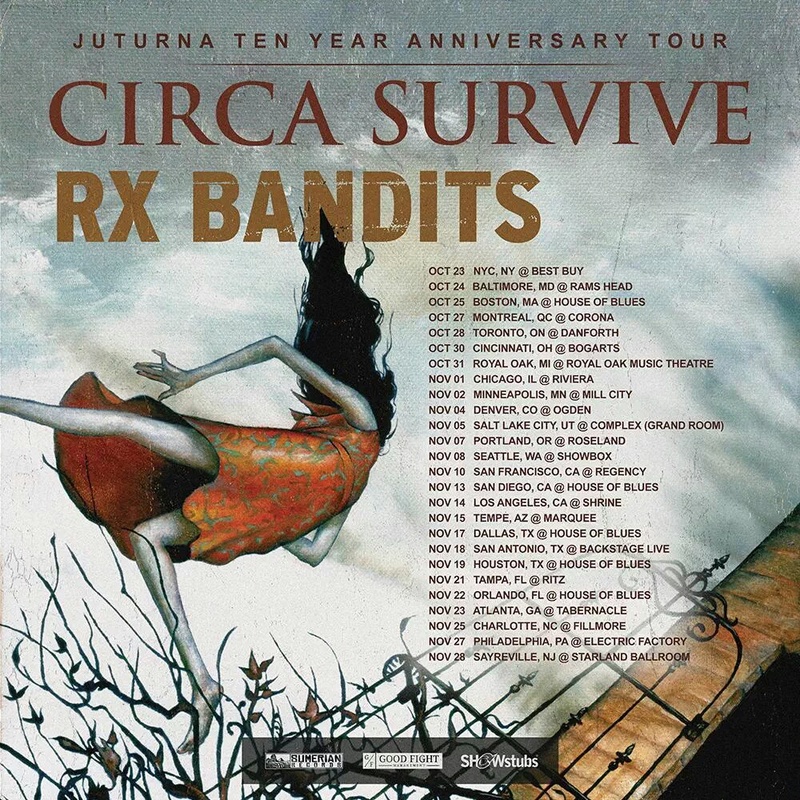 This entry was posted in Music News and tagged Circa Survive, Juturna, Juturna Tenth Anniversary Tour, music, music news, north america, tenth anniversary, tenth anniversary tour. Bookmark the permalink. Nirvana made an impact on the music world and no one would deny that, especially the people behind Robotic Empire. The label previously put out a vinyl of Nirvana covers titled In Utero: In Tribute which according to them sold out when it was released on Record Store Day last year. This Record Store Day, the label will once again be doing the same thing. This year’s Nirvana compilation will be titled Whatever, Nevermind and will feature bands such as La Dispute, Torche, Touche Amore, and the band whose contribution can be qualified as the first single off the album, Circa Survive. Circa got the task of covering Nirvana’s “Drain You,” which can be heard below. In an interview with Alternative Press, Circa guitarist Brendan Ekstrom said the following about getting the chance to cover the iconic band. Whatever, Nevermind will be available on April 18 (Record Store Day) while pre-orders of the record are currently available on the label’s website. This entry was posted in Music News, Streaming and tagged album, Circa Survive, compilation, Drain You, music, music news, Nirvana, robotic Empire, stream, streaming, Whatever Nevermind. Bookmark the permalink. It was only a month ago that Circa Survive were finishing up their last tour of the year with Pianos Become the Teeth and Title Fight. Now the band have announced they will once again be hitting the road, proving that they might be one of the hardest working bands out there. Taking to Facebook, the Philadelphia band announced their new tour which will feature special guests, Balance and Composure and CHON. The tour will begin on March 16 in Raleigh NC at the Lincoln Theater and wrap up almost two months later on May 3 in Stroudsburg, PA at the Sherman Theater. VIP tickets for the shows are currently on sale. This tour, much like the others, is in support of the band’s recently released album, Descensus which was released last November through Sumerian Records. This entry was posted in Music News and tagged Balance & Composure, CHON, Circa Survive, Descensus, music, music news, tour, tour dates. Bookmark the permalink. Circa Survive are giving their fans a little something to start their weekend off on the right foot; a new music video. The band have released the music video for a song titled, “Child of the Desert” featured on their recently released album, Descensus. The video features what looks like slowed down live footage of the band performing the song. With the lighting and the close ups of the band members, it almost makes you feel like you’re actually in a darkly lit club, watching Circa Survive perform this track live. Don’t believe us? Watch the video below. Circa Survive released Descensus, their fifth studio record on Nov. 24, 2014 through new record label, Sumerian Records. Circa were also confirmed as one of Coachella’s many performers for this year’s annual event, playing the stage on both Sundays of the festival; April 12 and April 19. This entry was posted in Music News, Music Videos and tagged Child of the Desert, Circa Survive, concert, Descensus, live footage, music, music news, music video. Bookmark the permalink. 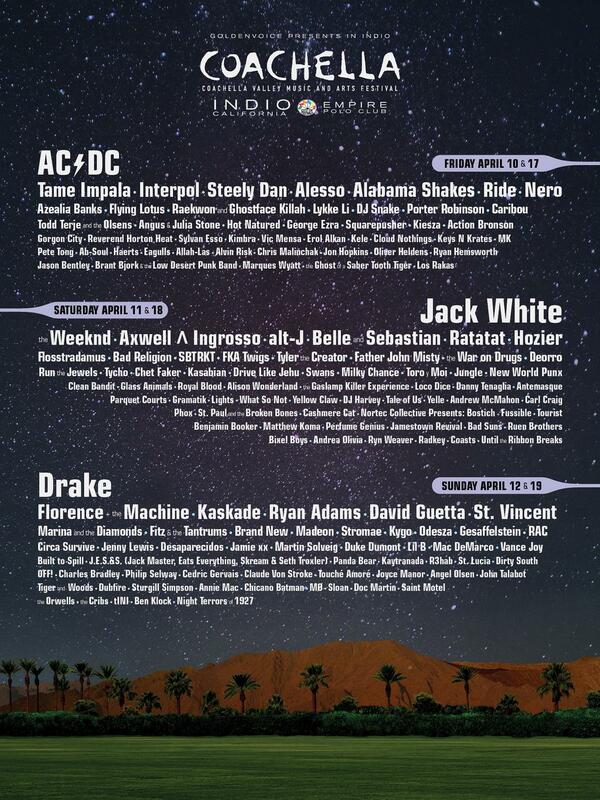 Following a few months of speculation and predictions, the line-up for this year’s Coachella has been revealed. The festival organizers took to Twitter to break the new in which they wrote, “For those about to RT.” A photo was attached to the tweet which contained the full line-up of all the artists who will take the trip to California in April. Performers for the two weekend-long festival will include: AC/DC, Jack White, Brand New, Bad Religion, Circa Survive, Interpol, Belle and Sebastian, Drake, Florence and the Machine, Kaskade, Ryan Adams, David Guetta, Fitz and the Tantrum, Marina and the Diamonds, LIGHTS, Andrew McMahon, and many, many more. Check out the full, and pretty lengthy, list below. 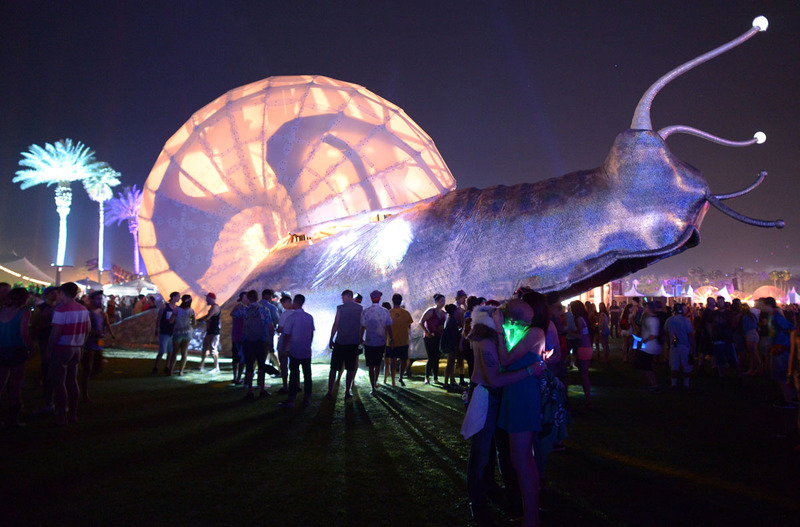 The Coachella Valley Music and Arts Festival will take place in Indio during two consecutive weekends in April. The first weekend will take place April 10-12 while the second weekend will take place April 17-19. This entry was posted in Music News and tagged AC/DC, Andrew McMahon, Bad Religion, Belle and Sebastian, Brand New, California, Circa Survive, Coachella, concert, David Guetta, Drake, festival, Fitz and the Tantrum, Florence and the Machine, Interpol, Jack White, Kaskade, Lights, Marina and the Diamonds, music, music news, Ryan Adams, shows. Bookmark the permalink.